It's not the time of year when you expect to see much going on in the forest, but you know, going for a walk with birders in search for the "confusing fall warblers". So as TPP is always looking down, this fern popped right out. Like spring wild flowers this little fern was expected in the spring, although this particular species has leaves that turn bronze and persist until spring. It was not expected to have fertile fronds. This is one of the rattlesnake ferns, formerly the genus Botrychium, but now Sceptridium, S. dissectum obliquum, the bronze fern. TPP really hates this name change, as the older genus has been in the memory banks for at least 45 years. This plant consists of either one or two leaves, one sterile frond, which can be somewhat bigger, and more dissected, than this one, and a second frond that consists largely of sporangia (cream colored here), which when present rises above the fertile frond (the petioles can be fused appearing as one). The gametophytes are subterranean and so are seldom seen. The whole fern is only about 5-6 inches tall. It's not actually rare but seldom noticed. This fern may be a bit mixed up because of the weather like a few other plants. Because such plants are seldom noticed, many people think they are rare plants; sort of but not as much as they think. TPP feels horrible; he is in the grips of a flu-like substance. The Phactors were in rural North Carolina for a wedding of a nephew, and Mrs. Phactor's family does love these opportunities to get together and whoop it up, and to be fair they are pretty good fun. On one hand it would be unfair to blame them for my illness, but they are a group of huggers and kissers. Let's check the flu-like substance symptoms: fever, check. Not very high, but enough to make you feel miserable. Congestion, check. My sinuses feel like they will burst and TPP feels like he's already swallowed a bucketful running down his throat. Headache, check. Every cough (check), makes the old head feel like it will explode. Watery eyes, ? not sure about this one. The eyes are definitely watery, but not sure if this belongs to the flu-like substance or not; they've been watery for weeks and attributed to harvest dust. General fatigue, check. Good thing Mrs. Phactor & F1 could take over driving. Even fell asleep while listening to a damned-good pod cast (S-Town, This American Life). Highly recommended. This was after relinquishing the driver's seat. Runny nose, check. Annoying as hell; tissues always within reach. Sore throat, not so much. Sneezing, check. Redness of skin & eyes, the latter are plenty red, but not the skin. Well, not a bad run of symptoms, all but one at least in part. And TPP did not yet get a flu shot for this year. Hard to know if they work or not now. Erasing Nature is a title stolen/borrowed/reused from the Garden Rant blog (love those people). TPP has long fought against plant blindness, but this goes to the level of replacing nature with digital technology. TPP finds this totally appalling. Acorn, adder, ash, beech, bluebell, buttercup, catkin, conker, cowslip, cygnet, dandelion, fern, hazel, heather, heron, ivy, kingfisher, lark, mistletoe, nectar, newt, otter, pasture and willow; all these words have been left out of the new edition of the Oxford Junior Dictionary and here's the new words added: attachment, block-graph, blog, broadband, bullet-point, celebrity, chatroom, committee, cut-and-paste, MP3 player and voice-mail. Of course 2/3s of the cuts are botanical. And because they have so little experience with nature many teachers are no help at all. Damn, TPP tries not to read news about the POTUS, so he turns to gardening blogs, and gets all depressed anyways. Dear Readers, The Phytophactor is in the planning phases of a field trip to New Zealand; it's been at least 30 years since he last visited. So what he needs is a decent plant identification book that does not come in a 10 volume set. Traveling light and limited luggage you know. For recording those plants (and scenery), while iphone cameras are far better than they used to be, TPP still likes to have a camera with controls that go beyond point and shoot. Liked my Nikon P7000, but it's getting a bit long in the tooth. Love the close up focusing of those Nikon lens. Traveled for years with lens and camera backs and lots more, but as the years have accumulated, the convenience of a compact camera has increased. So what advice do people out there have for TPP? Advise me well grasshoppers, and you will be rewarded with many fine blogs. The screwy weather of 2017 has some of TPP's plants confused. June was quite hot, July & August were cooler and wetter, September started cool but then got hot and very dry. And as Fall continued and the days shortened, the weather got cooler and rains finally relieved the drought. But no cold weather even into early October (except for the last 24 hrs). so some plants are a bit confused about what time of year it is. Today's sunflower, or more usually a rock rose, an ornamental variety generally placed in the species Helianthemum nummularium, a member of the Cistaceae. The genus means sun flower, but so does Helianthus. Members of this family, and this genus, and this species are pretty common ornamentals of the Mediterranean region, but most of them are not hardy here in zone 5. It's a small, low, evergreen shrub that makes a nice border and ground cover. After looking sort of rough most of the early summer and not flowering then (perhaps recovering from winter), one of two plants decided to flower now! Pretty bright flower, but not a big display. Nice in a protected area. Busy weekend has put TPP behind. This was pretty interesting. Stylized dinosaurs rendered as fruits by computer intelligence, although clearly a lot of instructions were needed. Still they are pretty neat. Enjoy. Here's a weed of the week (WOTW) that ranges from utterly insignificant to just small. It grows in a low, spreading mat, seldom more than a centimeter tall, and is sometimes called the sandmat or prostrate spurge. Officially it has the totally appropriate name Euphorbia prostrata. It can grow, quickly, from cracks or seams in sidewalks, and it is very prolific making lots of seeds so this naturalized annual is sure to reappear next year. While it can be pulled (do take care, the milky sap can be irritating) an herbicide treatment is perhaps the only way to keep this weed under control. However you can at least admire how efficiently it covers space, and of course, the remarkable beauty of its flowering and fruiting display. There are a couple of similar species, E. maculata and E. serpens, but generally these species have smooth stems and leaves while E. prostrata is hairy. Ever wonder why botanists often have a hand lens, which is their version of bling? It's to see if plants like this are hairy or not. The outdoor gardening season is just about done. The monkshood or wolf bane is just coming into flower here in early October, right on schedule. Red October the lastest flowering hosta is just finishing up. And TPP must turn his attention to the glasshouse to find flowers of interest. One bed of succulents has a huge clone of a relatively common Aloe, and every decent sized stem was in flower. There are over 500 species and lots of cultivars, and TPP has no idea what this one is. Any suggestions? Quite colorful in a salmon sort of way. This inflorescence is a near perfect example of a raceme, a single central stem with an ascending helix of stalked flowers. With so many flowers it takes quite a few days to flower from bottom to top. Note how the flowers change position as they come into flower. The lowest flowers are in a pollen accepting phase with the stigma protruding from the corolla. No hummingbirds were around, but a little self-pollination will produce a few fruits. The whole thing makes for quite a visual display. One of the things TPP misses the most about teaching is finding interesting connections between botany and other cultural things and lacking a class of interested (?) students to present them to. Perhaps TPP is weird in this regard, but people who find "connections" interesting always seem to have the best scholarly attitudes or at least an intellectual curiosity. Ergot is a fungal parasite of cereal grains and when its spores contaminate flour and bread, it can produce dramatic side effects, various forms of ergotism, the stuff of the Salem witch trials, and effects that include hallucinations. So this article investigates whether hallucinations ever influenced art especially a fellow like Hieronymus Bosch who really painted some strange images, strange enough that it is not difficult to imagine he was under some kind of hallucinogenic influence. 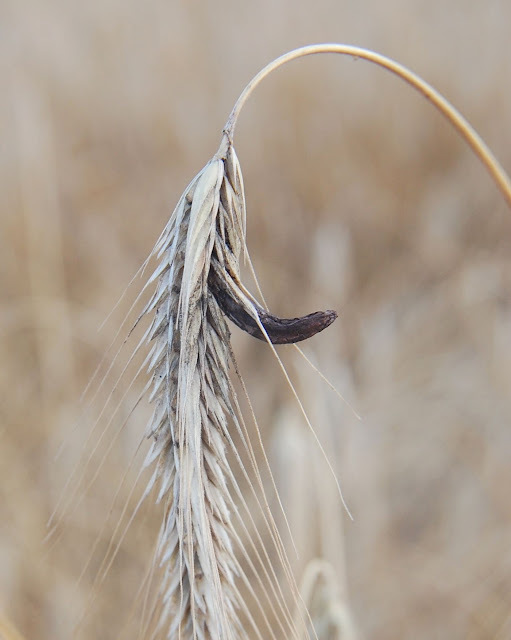 Image shows an ergot spore body replacing a cereal grain where it could contaminate flour ultimately leading to the idea that the whiter the flour the more pure it was (image from the Wikimedia Creative Commons complements of Accipiter). September is always one of our drier months, but locally our rainfall is less than half of the average amount. The Phactors have done slightly better than the general area and our gardens are parched. Very large, old trees are showing signs of stress. Leaf fall is starting quite early and the lawn has a nice crunch when you walk across it. Several poorly established shrubs, mostly sort of new, have already died. So far a lilac, and a male winter berry have gone belly up, several more look very sad. A few things may survive and reappear come spring, but some will go missing. And it isn't as though we have not been watering. This is a drought. We've had one 1.25 inch rainfall for the whole month. Fall color is going to be a bust as leaves simply turn brown. And do remember winter is mostly about dry conditions, so unless things turn around, we'll be watering some things in December. The cool August & early Sept. followed by hot weather, and lack of rain have some plants very confused. A "Christmas" cactus is covered in buds, a non-hardy azalea that usually blooms in Jan.-Feb. has a couple of flowers open.